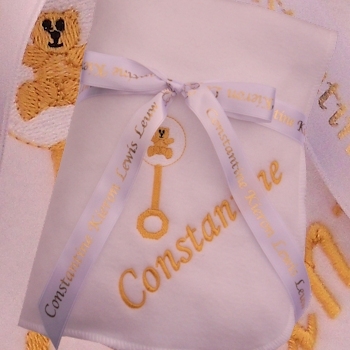 White fleece baby blanket with embroidered rattle motif and name presented with a personalised ribbon tied around to make this gift extra special. Unisex pram size fleece blanket at 75 x 100cm. Lovely quality anitpil polyester polar fleece in soft white. Unisex pram size fleece blanket at 75 x 100cm. Lovely quality anitpil polyester polar fleece in soft white. Sewn with a overcast blanket stitch edge. You choose a thread colour and letter font style for the personalised text and motif. Enter the name or name and DOB you want embroidered on the blanket. Enter a brief message you want on the custom printed ribbon. For example the ribbon can indicate who the gift is to and from or perhaps a message of congratulations on the birth of a baby boy or girl. We will select a ribbon colour to coordinate with the blanket.